In need of steel fabrication equipment? Well your next metal working project has met their match. 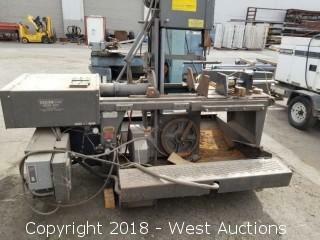 This online auction of metal working tools and equipment features a superb selection with 243 lots that include trucks, a semi-trailer truck, trailers, a crane, forklifts, lathes, milling machines, hydraulic punch presses, and other metal working tools & equipment. Come to our scheduled preview and view all these lots in person. Hurry now, they will sell regardless of price. Lot #0107 Jet Vertical Mill 12" x 48"
Note: Certificate of Title, DMV transfer form will be mailed 4-6 weeks following close of auction. Buyer is fully responsible for all aspects of registration and fees due DMV. Note: Certificate of Title, DMV transfer form and Certificate of Smog will be mailed 4-6 weeks following close of auction. Buyer is fully responsible for all aspects of registration and fees due DMV. Note: This item is not actively registered with California DMV. Buyer will receive Bill of Sale only, and will be mailed 4-6 weeks following close of auction. Buyer is fully responsible for all aspects of registration process if desired to obtain title/registration, and is responsible for all fees due to DMV. Jet Vertical Mill 12" x 48"
Table size 12" x 48"
Seller states: total miles approx 450k, top rebuilt approx 50 miles, truck wrecked ontest drive. Page last refreshed Wed, Apr 24, 10:44pm PT.